After nearly seven years of blogging, and reading other blogs and perusing the Internet, I am pleasantly surprised that I can still be surprised. There is good news, and there are inspiring stories, new ideas, funny insights, helpful suggestions, silly jokes, entertaining videos, pointless ponderables... it's all out there waiting to be discovered and sharing the surprises is one of my favorite parts of blogging. Sometimes I think I could retire from actually contributing new material and just spend my time pointing out all the talents, the industrious people, highlight those that do marvelous things and humble things and hilarious things. Last night I swept the chicken coop and did lots of toting, baling, hauling, shifting and shoving, and between trips from the front yard to the back, I would see Grandma's geraniums. Sigh. I do not like geraniums. There. I said it. Maybe I have said it before, but even thinking it makes me feel ashamed. 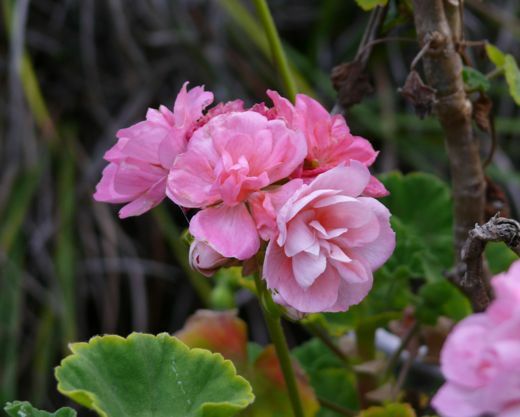 Geraniums have so many qualities to admire... colors, full and frilly petals, lovely leaves and most of all their hardiness. But still, honestly, I do not like them. It's the smell. Mmph. Not nice. Not for me. But these are Grandmother's geraniums and she tended them and propagated them and moved them from home to home and replanted them in bigger pots, and so even though I do not like geraniums, I do love Grandmother's geraniums. All through the blogosphere people are posting about signs of Spring and what is happening in their gardens. Alas, my garden is really Garybob the landlord's garden, so I am going to point out other gardens for you to enjoy... like the flowers in bloom at "The Big Yellow Farmhouse." Alicia Paulson has posted all sorts of photographs and reflections on Spring in Portland.. get Cozy with Posie for garden inspiration and virtual neighborhood walks. 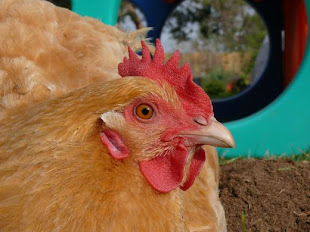 I honored Earth Day by sweeping fallen leaves and moving earthworms to a spot safe from the hens... Turkey Feathers enjoyed time in her garden planting seeds in the earth and inside under a grow light. And to make all of our flowers happy some gardeners go the extra mile... I am talking about "honey super cells..." well, no. Not me. Warren, at Home Among The Hills is talking about bees and beehives and wax and silky cocoons. It's all there. It's all good. It's almost risky visiting bloggers like Amanda Soule... supposedly I am cleaning house and doing errands, but when I see her patchwork quilts and wool needle felting... I get completely lost in a dreamy state of wishful thinking. And of course reading one crafty blog only leads to opening more pages from other talented, inspiring crafty bloggers, so naturally I found myself visiting Anna Maria Horner, her latest post reveals special news about their growing family. She says "Little=Happy" but I always find big inspiration in her art, decorating and fabric designs. Speaking of felt birds and bees, do you know where babies come from? Do you know how to make a baby? I had to look when "Oijoyphoto, The Blog" posted Como Hacer un Bebé and I was not disappointed. oh my goodness natalie.. i thought i was the only one who despised geraniums! i have felt shame over it for years... whew! you have made my day! 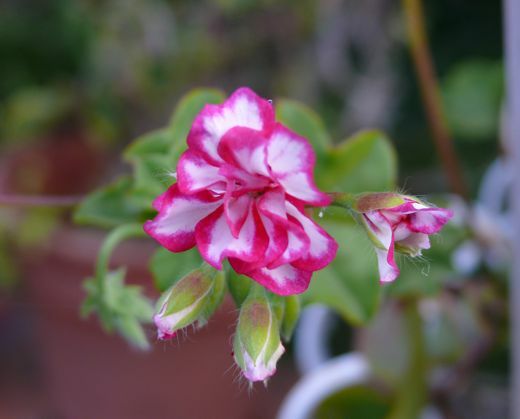 I'm not too fond of Geraniums either, but if they're growing and green, I'll leave them alone. 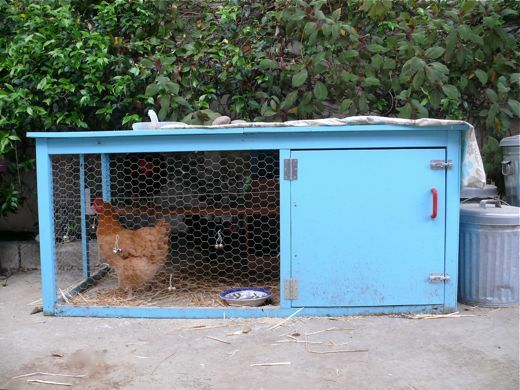 I love your chicken coop - that blue really stands out. Natalie, you are also one of those who do marvelous, humble and hilarious things. You and your family are a joy to watch. Thinking of you! Hope all are well, talk soon.